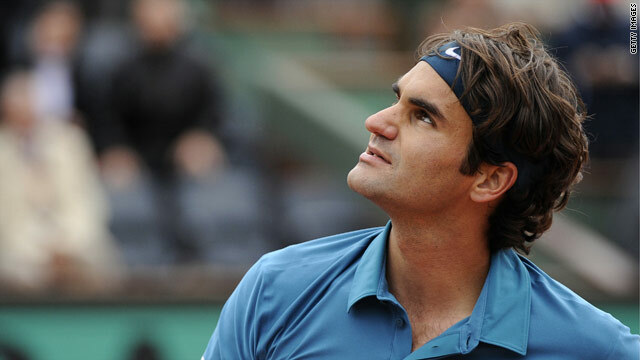 Roger Federer looks to the heavens after his straight sets victory over Swiss compatriot Stanislas Wawrinka. (CNN) -- Top seed and defending champion Roger Federer cruised into the quarterfinals of the French Open with a ruthless dispatch of Swiss compatriot Stanislav Wawrinka in Paris on Sunday. Federer showed mo mercy to his Olympic gold doubles teammate to hand out a 6-3 7-6 6-2 defeat in their fourth round match at Roland Garros. Reward for the world number one is a clash with Robin Soderling, the Swedish fifth seed who he defeated in the final last year to complete his collection of grand slam titles. Soderling caused the shock of last year's tournament by putting out four-time champion Rafael Nadal and showed he is in fine fettle again with a 6-4 6-4 6-2 rout of Croatian 10th seed Marin Cilic in a later match. But there was disappointment for the home crowd as eighth-seeded Jo-Wilfried Tsonga was forced to retire from his clash with Russian 11th seed Mikhail Youzhny with a groin injury when trailing by a set. Youzhny will next play 12th seed Tomas Berdych, who beat fourth-ranked Andy Murray in a late evening upset. Czech Berdych was in superb form as he took the opener and took an early lead in the second before Murray enjoyed his best period of the match. He broke back to level, but with the momentum with him, rain caused a short delay. Berdych promptly rediscovered his best form on their return and took the second set before a single break saw him home in the fourth in fading gloom. Federer has reached the quarterfinals without losing a set and will be looking to extend his perfect record against Soderling, winning all 12 of their previous matches. "I could have lost a set against Alejandro Falla in the second round and today against Stan and after this, you never know," Federer told gathered reporters. "So I am happy with what's happened. I'm playing well, serving well and moving well. I hope it continues like this." Wawrinka had his best chance to get back into the match in the second set as he broke only to be pulled back. At 5-5 in the tiebreak, he made a volley error and Federer duly capitalized to take a lead he never relinquished as he cruised through the final set.